Physicians prescribe an arthrography when they want to determine the exact position for alleviating joint pain. This exam uses a minimum dose of radiation. We suggest that you arrive 15 minutes prior to your appointment. 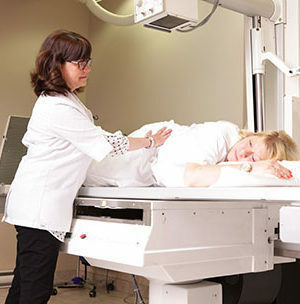 There is no preparation required for an appointment in general radiology. A few minutes after you register, a member of our team will lead you to the changing room so you can put on an examination gown. The procedure will be explained to you throughout the exam. The x-rays will be studied by the radiologist after you leave. A final report will be sent to your doctor within 24 to 48 hours.